CBS11 meteorologist Kristine Kahanek officially signed off at the end of Friday's 4 p.m. newscast, ending a seven-year career with the station. Kahanek told viewers that her contract didn't expire until September, "but I've chosen to go ahead and leave early." It was clear to her, however, that she didn't figure in the station's long-term future plans. (See story below). Kahanek was the only on-air personality to depart the station Friday amid a round of layoffs that also claimed assistant news director Sarah Garza. "Be blessed and I'll miss all of you. 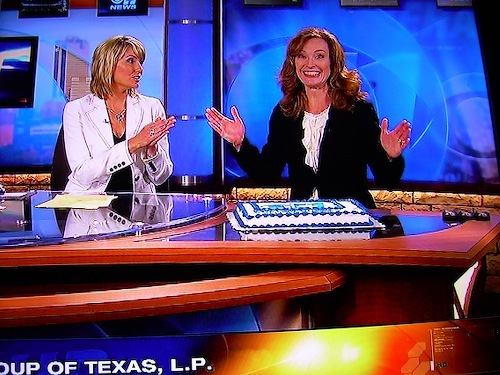 And thanks for watching," she said before a goodbye sheet cake was slid onto the anchor desk at newscast's end.